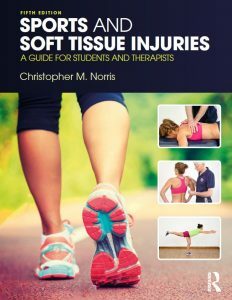 Sports Injuries has been the textbook for which clinic director Dr Christopher Norris is best known within the therapy and exercise world. 2018 saw the release of the most recent edition of this renowned text, and in this blog, we take a look at the book, its history, and why it has become so popular. The First edition of Sports Injuries was released in 1993 and broke new ground for a therapy textbook. It quickly became a well-thumbed book in student rooms and university libraries and many senior physiotherapists recall using the ‘red book’ when they were students themselves. But why was it so popular? To understand this, we need to go back nearly 30 years to a time when physiotherapy was a very different profession. At that time physiotherapists trained in hospitals gaining a diploma (not a degree) which was awarded by their own profession. They were often told which treatments to use by Doctors, and most treatments were based on electrical machines or massage type actions. Only a few physiotherapists used exercise, as this was often left to another profession – the Remedial Gymnasts. This profession was established after the second world war and taught physical training instructors to use exercise on injured military personnel. In the 1990’s the government determined that the Physiotherapy and Remedial Gymnast professions should amalgamate and become one. What occurred was a strengthening of exercise knowledge within physiotherapy and a sudden wider interest in rehabilitation within the health professions in general. The first edition of sports injuries came at a time when this change was taking place within physiotherapy and people were waking up to the use of exercise as a therapy. The focus of Sports injuries on rehab and its emphasis on physiotherapists as self-determining practitioners (the official title of the book was Sports injuries: diagnosis and management) was greeted with enthusiasm within both the physiotherapy profession and the newly developing profession of exercise professionals. The second edition of the book came in 1998 with more pages, more techniques, and a wider evidence base, and the third edition, published in 2004 went to a larger hardback format and introduced colour coded pages, and clinical photographs, adding to usability. The 4th edition launched in 2011 with full colour line figures and colour photographs, and gained top reviews from online book sellers, reviewers, and users. Over a period of 25 years Sports Injuries has become one of the predominant texts in the area of soft tissue injury management. It has appealed equally to therapists and exercise professionals as a reference book and clinical guide. The combination of scientific evidence with practical treatment guidance strikes a chord with students and junior therapists especially. To celebrate 25 years in print, the most recent version (5th edition) has expanded to nearly 700 pages. That’s not the only change. The publishers are now Routledge (part of the Taylor & Francis group) and the title has been updated to Sports & Soft Tissue Injuries to reflect a broader usage. The text is softback with high quality satin paper, full colour images and line figures, colour tables and graphs, and a two-column layout to enhance readability. To improve understanding the book regularly lists keypoints and text definitions is colour boxes and contains separate ‘treatment note’ sections to go further into specific areas. The practical feel is boosted too. Tables, text, and colour photographs often describe most complex practical techniques in stages and the total number of colour images is significantly increased. The book size is now smaller (back to the size of the second and most popular edition) to aid portability, and a hard-back edition (for libraries) and eBook version are available. 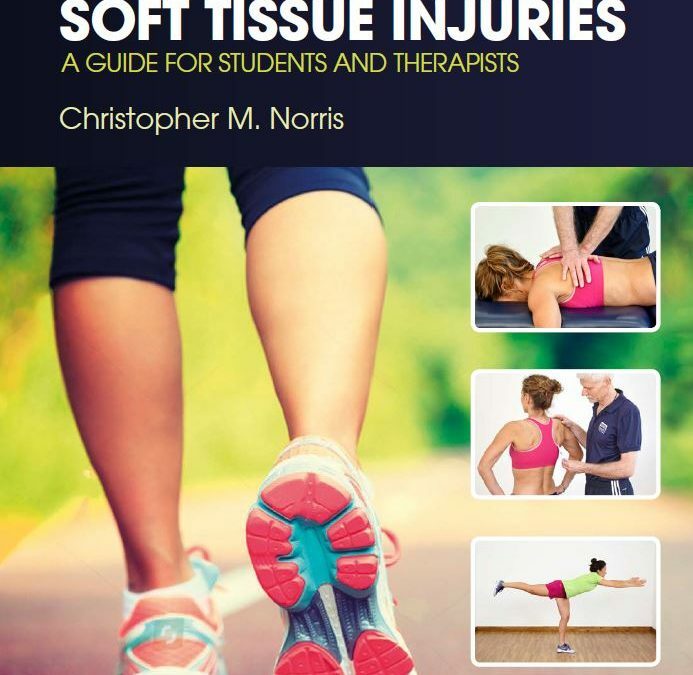 Sports and Soft Tissue Injuries (SSTI) begins with a whole chapter on how individual tissues heal. This sets the foundation of good treatment practice, as a knowledge of healing and what goes wrong with tissues (pathology) is essential for effective treatment. We cover the process of inflammation and healing, and then go on to learn about injury to muscles, tendons, ligaments, fascia, nerves, synovium, capsule and articular cartilage. There are eight treatment notes in this chapter with give more in-depth detail on medication used in sports injuries, patient examination, pain, dry needling, mechanical properties of tissue, diagnostic imaging, and training fascia. Chapter two is one of the largest in the book (66 pages) and deals with rehabilitation science. This reflects the importance of exercise therapy both in the treatment and prevention of injury. We look in detail at each of the individual components of fitness and learn how to structure a rehab programme. Strength physiology is covered together with methods of making exercise harder or easier to match a subject’s requirements (progression and regression). The principles of strength and conditioning are covered, together with stretching, plyometrics, muscle balance, and proprioceptive training. The treatment notes in this chapter dig deeper into overtraining, tissue homeostasis, warm-up, stretching, periodization, resistance training, and skill training. Chapters 3-14 cover injuries to the body through each bodypart, from face to foot and everything in between. The injuries covered are largely musculoskeletal and the treatment used non-invasive. These conditions are often encountered when performing sport or exercise, but also form the major portion of aches and pain individuals encounter throughout day to day living. There is considerable detail on each condition with numerous references (at chapter ends) supporting the evidence base of the book. The book places equal importance on up-to-the-minute science and clinical experience giving the book a contemporary ‘practical feel’ while strengthening its contribution to evidence-based practice (EBP). If we take the knee as an example (chapter 4), we cover patella femoral pain syndrome (PRPS), including biomechanics, taping, and re-training. We look at ITB syndrome, knee ligament injury, cruciate ligaments (including full protocols following ACL repair), neuromuscular training of the knee, meniscal injury, patellar tendon pain, knee arthritis, imaging, adolescent knee pain, bursitis, and fat pads. In each case in-depth anatomy and pathology sets the foundation for treatment techniques which are described in detail. Colour photographs illustrate techniques and rehab drills, tables and charts guide programmes, and keypoints & definition boxes explain essential points. Over 78 pages readers will learn in detail how to assess and manage knee injuries confidently and thoroughly. The fifth edition of Sports Injuries is a vital resource for students and practitioners of sports therapy, physiotherapy, sports medicine and athletic training. It will also be of interest to exercise professionals and sports coaches and to those who often exercise. Whether it is regularly ‘dipped into’ throughout a training course, used as an essential reference in the clinic, or read in detail when preparing for assignments and exams, Sports & Soft Tissue Injuries will enable you to lead the pack. Very interested in acquiring this book.. however I have to say some Physiotherapy schools taught and used a lot of exercise in the ‘old days’ At Manchester Royal we ran lots of exercise classes and 1:1 too.. including ward classes , outpatients and maternity.. it’s not right to say we only learned electrical and massage.. Still want the book though! Yes, certainly agree that exercise was taught, but perhaps not emphasized as it is now. Most things in physio have moved forwards, although I sometimes think the patient care portion has sometimes suffered.